I’m very pleased to see that The First Battle is getting 5 star reviews on Amazon! Woot! But I really want to know what BlogClan think because it’s my first book in the Dawn of the Clans arc. WARNING: this is a spoiler page. Don’t read the comments if you don’t want to know what happens! 191 Responses to "The First Battle Spoiler Page"
Kate, a few questions: Who’s Point of View will be introduced in The Blazing Star, Wind Runner’s or River Ripple’s, since Tall Shadow’s PoV will be in A Forest Divided? 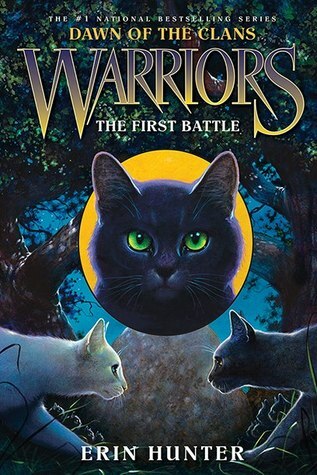 Also, why was Tall Shadow on the cover of The First Battle when she didn’t even have a PoV in the book and what will the sixth book be called? And is Jay Frost one of Moon Shadow and Dewy Leaf’s kits? One more thing, are Night and Nightheart the same cat? Nightheart was mentioned by Petal in the bonus scene of The Sun Trail in case you don’t remember. That’s okay, Kate—I understand. I appriciate that you at least responded, thank you. Oh, and even though it seems pretty obvious by the name, are Owl Eyes and Owleyes/star the same cat? Did Rainswept Flower love Jagged Peak, as heavily implied in Thunder Rising? If so, did Jagged Peak return her feelings? I think they do, if the cat wants them to. Some cats may see their scars as part of who they are and keep them, some may think the scars spoil who they are. I suspect that Brightheart would love to be the beautiful young cat she used to be and she would lose her wounds in StarClan. Did Rainswept Flower love Jagged Peak, and did Jagged Peak love her? Also, who is Clear Sky’s true love, Bright stream or Storm? it does deserve 5 stars!